Schedule your annual eye exam with your Vision Source® optometrist to find out if a silicone hydrogel contact lens might be the right choice for your lifestyle. What inspires our contact lens designs? Your eyes are our inspiration. We work tirelessly to create contact lenses that work in harmony with your unique eyes, the lifestyle you live and your vision correction needs. 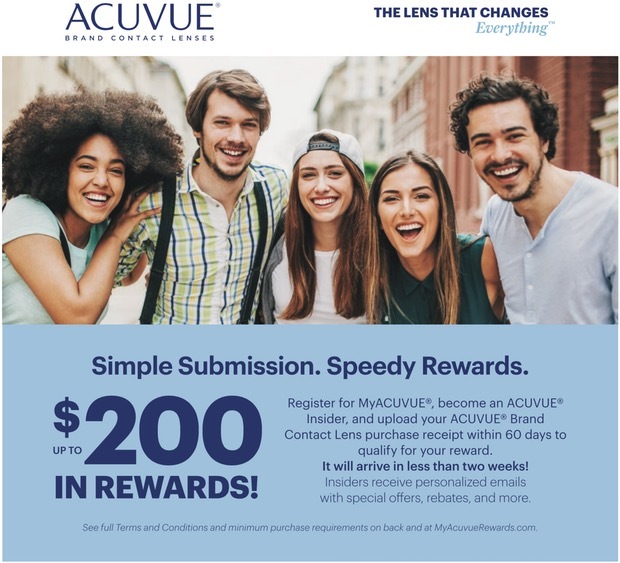 After purchasing your Acuvue® vita®, Acuvue® Oasys, 1-Day Acuvue® Moist, or Acuvue® Oasys with HydraLuxe™ contact lenses from a participating Vision Source® optometrist, download this rebate and follow the instructions to qualify for your reward. See rebate for details. Valid at select Vision Source® practices only. See rebate for details. Please take a moment and let us know how your experience was. Copyright © 2019 Vandergrift Family Eye Care. All rights reserved.